Hope you are enjoying the winter weather and getting out there! Winter officially begins on Saturday. Join us this week for these runs. 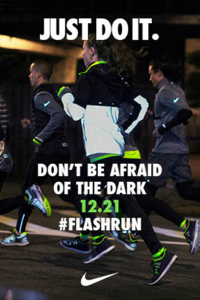 Sat Dec 21- Free Flash Run 12.21.13. Dress in your most reflective gear and get ready for a 3 mile fun run combined with some “unique” assignments along the route. Fleet Feet Sports, 6:15pm. Note: Next week no fun run on Wed eve 12/25 or pub run on Thur eve 12/26--Enjoy the holiday!